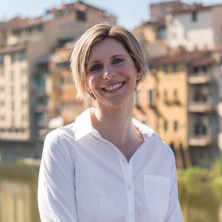 Born in Alabama and raised in Northern California, Alexandra first moved to Florence in 1999 after a degree Political Science at the College of Charleston. She then studied Italian Literature—with an emphasis on Dante’s Purgatorio—at the graduate level, and completed an exciting 800-hour journey through Florence’s art and history to become a licensed guide for the city and province. Alexandra is the former Managing Editor of The Florentine news magazine, as well as a lecturer on contemporary Italian culture at several local American and British universities.